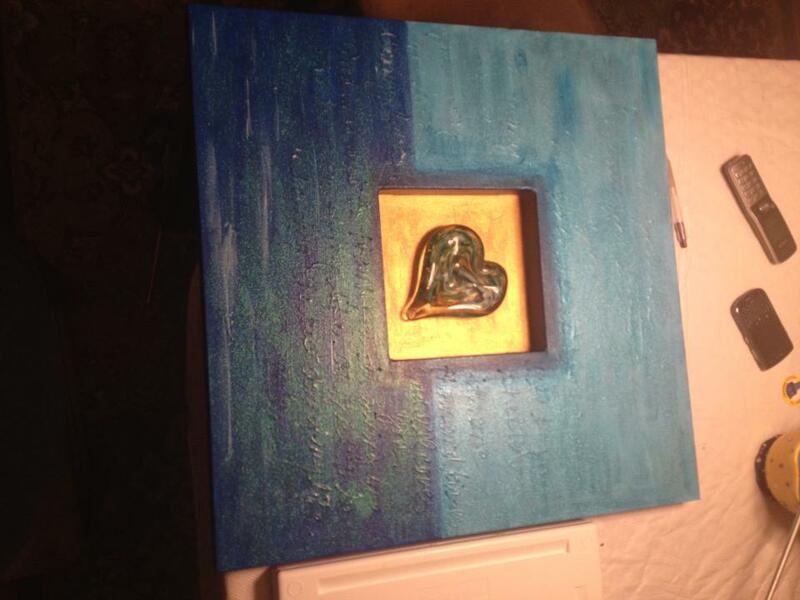 This is a series of 3 paintings with handblown glass hearts as focal points. 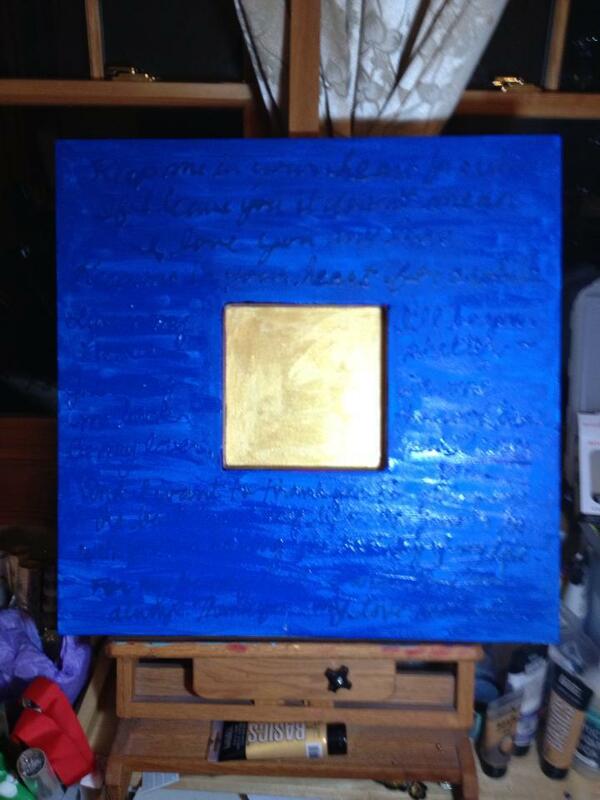 Each painting has lyrics of songs as a base layer. It took me nearly a year to even begin to paint something for Nick. I guess it was just too painful. I wanted to paint something to remember him, to celebrate him. 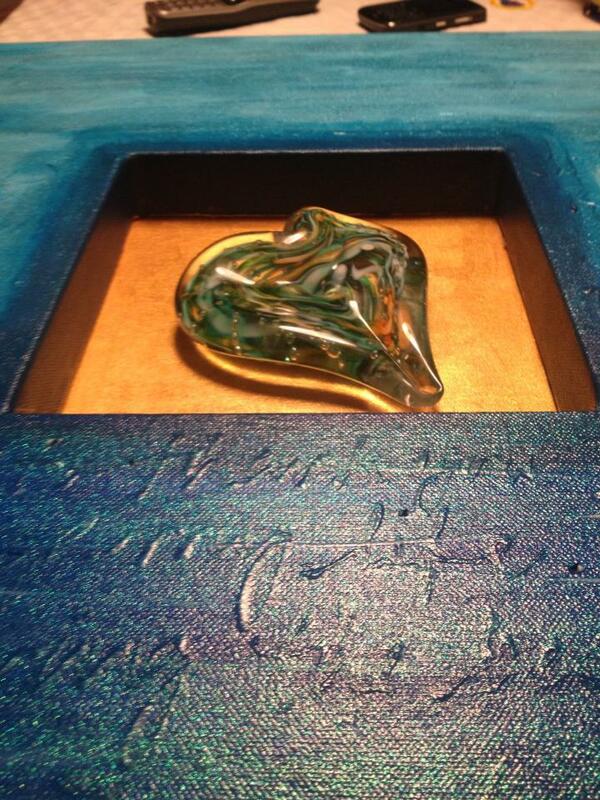 The glass heart was my first attempt at glass blowing and I made it in March of 2012 and gave it to Nick. 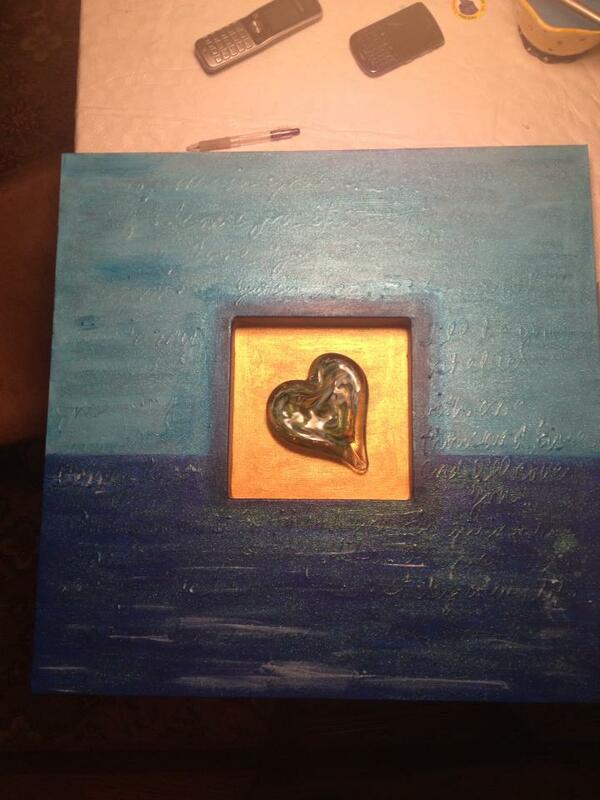 He was already in hospice at that time and he kept this heart next to his bedside. The imprint on the heart is an acorn. I wasn’t sure why I chose that at the time (in the class they gave us about 5 minutes to choose something), but I think it makes sense to me now. From a small acorn grows a grand tree. In our front yard after a great storm during winter 1998 downed our huge old modesto ash, we relandscaped and Nick and I researched hundreds of trees. We wanted the right tree that would grow tall and shade our little cottage. We chose the great scarlet oak which is now growing tall in our front yard. My daughter refers to it as “daddy’s tree” and how fitting a strong and beautiful oak tree, standing majestically protecting our home. This first painting has lyrics from 3 songs that remind me so much of Nick. The first song is a Warren Zevon song that Nick picked out when watching a sad Adam Sandler movie called, “Funny People”. This song used to bring tears to Nick’s eyes and I could tell when he listened to it how sad he was to be leaving us behind. The other two songs are memories of early on in our courtship. “I’ll cover you” is from the Broadway play, “RENT” and “Thank you” by Dido was the song for our first dance at our wedding. A special THANKS goes to Girl Glass Studio for guiding us in making these beautiful hand blown hearts. Sha-lalala-lala=li-lalala-lo, Keep me in your heart for while. I'LL COVER YOU from "RENT"